The first statement we encounter and likewise title of Peter Buggenhout’s second solo exhibition at the Konrad Fischer Galerie, Berlin, „Für Alle und Keinen“ (For All and None), addresses the individual existence and identity of its receiver/viewer as an open question – a problem. With respect to the works on view, the problem intimated by the exhibition’s title, which Buggenhout borrowed from the subtitle of Friedrich Nietzsche’s Thus Spoke Zarathustra (1883–85), is reintroduced as a problem of reception, identification, and communication in general. Buggenhout’s works – indeterminately shaped sculptures made of waste, dust, animal hair, intestines, and unidentifiable materials – are fundamentally associated with ruins. As such, his works reject the notion of persistence and completeness as well as progression and overcoming. They are formally indefinite, sabotaged, open-ended, avoiding positive signification and denotative representation; they appear outside descriptive language, outside recognizability, and therefore outside reason. The current exhibition – a heterogeneous triangular arrangement of three new sculptures, each of which is the vertex of the other two – crystalizes the core of Buggenhout’s work, as it marks its new territories. It starts with „Mont Ventoux #16“ (2015), a paraphernalia-like sculptural object/deformed figurine placed inside a glass case on a white wooden pedestal in front of the gallery’s entrance. Part of the „Mont Ventoux“ series begun in 1997, the work is a condensation of a cow stomach with both organic and inorganic debris, invoking and simulating aspects of ritualistic voodoo fetish and ethnographic display. It combines the inner with the outer, the performative with the museal, the possessed with the impersonal. 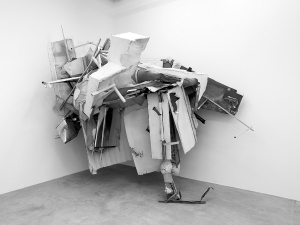 The exhibition continues with „The Blind Leading the Blind #68“ (2015), a recent example of Buggenhout’s signature dust sculptures: a large, contourless stack of wreckage concealed under a thick coat of dust, rendering the physical and formal properties of its components illegible, obscure, forgotten. The dust sculptures cannot be harnessed or appropriated. They do not attest to anything except the uncontrollable loss of codes, in the course of which things not only cease to exist, but can no longer be remembered for what they were. Blurring the difference between inclusion and erasure, assertion and elimination, Buggenhout’s dust sculptures are climactic topographies incorporating the viewer into an experience of indistinguishability, brokenness, entropy, and decay. They expose the subordination of everything – culture, history, and human existence – to nature, namely, to death; to dust. While demonstrating the inability to fix anything by burying it under dust, they confront us with the improbable fixation of their coats of dust. „On Hold #3“ (2015), the third vertex of the exhibition, opens up a new horizon. It is a site-specific corner installation, a low wall relief assembling wooden, metal, plastic, and textile fragments, held together by intertwined layers of foam and cast nylon. In comparison to the dust sculptures, and specifically to „The Blind Leading the Blind #68“, „On Hold #3“ ostensibly suggests composition and structure. Its color elements and its connection to the wall even provide it with painterly qualities. Yet a closer look reveals its irrational, contradictory dynamics, where, as indicated by the work’s title, logic is suspended, and the same things seem to move simultaneously to the left and to the right, upward and downward, as if erecting and falling, expanding and consolidating at the same time.